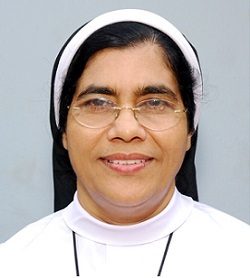 Dr. Sr. Treesa Palackal, S.H. Dr.Sr.Treesa Palackal SH is the Founder Director of Hrudayaram Psycho Centre which was started in the month of July 2000. Sr. Treesa was born in a rural village ‘Chempery’ of Kannur District, Kerala State. After her school education, she did graduation and post-graduation from the University of Calicut. Then she completed B.Ed, from University of Kerala. With a strong desire is to serve the people around, she joined as a teacher in B.V.J.M. High School Perumpadave, Kerala, India. For eight years she worked as a High school teacher. During this period in addition to teaching she has organized many training program for students to develop the life skills among them. In her school there was a ‘Girls’ wing’ and the aim of which was the welfare of the girl students of the school. Sr. Treesa was the in charge of the girls’ wing. This wing did a lot of work to reduce the dropout of girls. Family visits and pastoral work were the part of her routine. The experience as a teacher and a social worker provide her deep insights about the downtrodden sections of the society, especially the girls and the women. She realized that counseling and training programmes will be very much useful to these people. She decided to gain specialized training and education in counseling in order to equip herself to serve the society more effectively. So she went to Manila, Philippines. Then, completed M.Sc and Ph.D in counseling Psychology from De La Salle University. And also did a non-degree Diploma in Family counseling, from Atheneo University Manila through which she gained special skills for the assistance and empowerment of society. In the year of 1995 she came back to Kerala after her studies and during this time she got many offers from various colleges to take charge of their Psychology departments. But she was inspired to reject such offers as she thought that it would be a hindrance to her desire to provide service to the needy. So from 1995 onwards she dedicated herself to the fields of counseling. Sensing the need of the time with the cooperation of her congregation, she took initiative to start an organization to serve the needy people of the society. As a result in the year of 2000 Hrudayaram Psycho Center takes birth in the heart of Kannur City, Kerala State. Soon the Centre became very needed and wanted and proved that it is the need of the time. Hence, she resigned her job as a High school teacher without any monitory benefit and thrown herself completely to the counseling and training field. It is her effort, determination and hard work that makes Dr.Sr.Treesa Palackal as one of the notable social activist in Kerala. Sensing to the need of the society she devoted herself to it. By recognizing her radical commitment for the upliftment of the society, the Lions Club Kannur, selected Dr. Sr.Treesa Palackal for their Award more than one time. In 2005 Kannur South, honored her for rendering services in accordance with the need of the present scenario. Again, Lions and Lioness Clubs together, honored her as ‘The Duty Conscious Female Citizen’ in the District, in 2006. Now she is acting as the president of the Kerala Counsellors Forum, Kannur too. In addition, she is awarded by Archdiocese of Tellicherry, Uthara Kerala Sahithyavedi and Junior Chamber International for her dedication to the society and its needs.